Lesser scaup, photographed at Green Cay Nature Center, Boynton Beach, Palm Beach County, in January 2016. Even at a distance with the unaided eye, the lesser scaup, Aythya Affinis, appears different than the water fowl most commonly seen in South Florida during the cooler months. One, it's larger than most fowl, including the blue-winged teal and mottled duck. From our observations, it appears more likely to take to open water than either duck. And there is this: it feeds by diving rather than dabbling like the two aforementioned quackers. It is the most abundant diving duck in North America and a winter visiter to our neck of the woods. 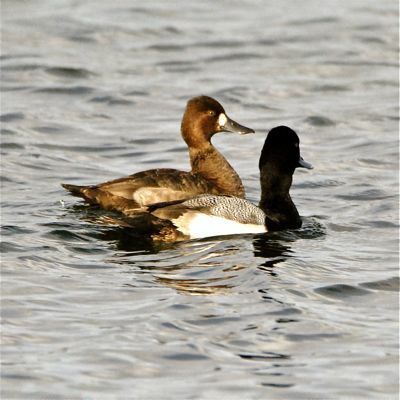 It has a close cousin, the greater scaup, Aythya marila, which is larger and tends to take more to salt water habitats while the lesser is more fond of fresh. The lesser also has a slight crest on the crown of its head; the greater scaup doesn't. 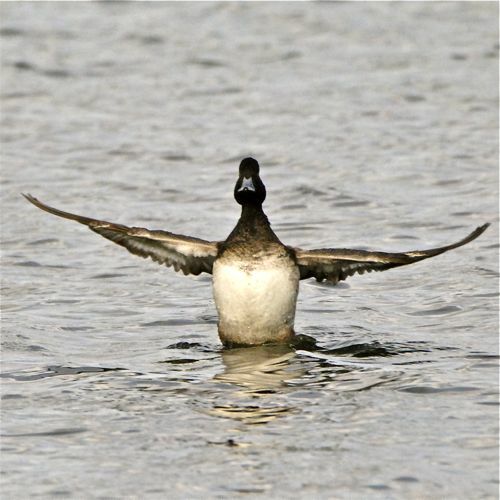 The lesser scaup is strictly a bird of the western hemisphere; the greater scaup's range spans Eurasia as well. By the way, scaup (pronounced skawp) is a Scotish variant of the northern English word, scalp, used in reference to a bed of shellfish and a likely place for these ducks to feed. We've various numbers for the size of this bird, from a body length of only 12 inches to as long as 17 inches, with a wingspan of 29 to 31 inches. Males are slightly larger than females and are the more colorful of the species. Males are blackish purple on the head and neck, with a light blue bill that has a black tip. Wings are white; back is mix of white and fine gray. The belly is white, the tail is black. Females are brownish, with a prominent white patch on their faces. The lesser scaup is mostly a migrating bird. Most of the population spends the summer breeding season in the central Rockies into northern Canada and Alaska. In the fall, they retreat south into the lower Mississippi River valley, along the Gulf Coast into Florida and along both the Pacific and Atlantic coasts. They also migrate as far as the northern tip of South America. The map for the greater scaup is similar, but their winter range doesn't quite extend into South Florida. As we noted above, these birds forage by diving through the water, as the male in the picture below left is beginning to do. They become completely submerged as they hunt for a meal. Dabblers, like the blue-winged teal or the mottled duck, go face down while foraging, but their rears remain above the water. Think of a human bobbing for apples. 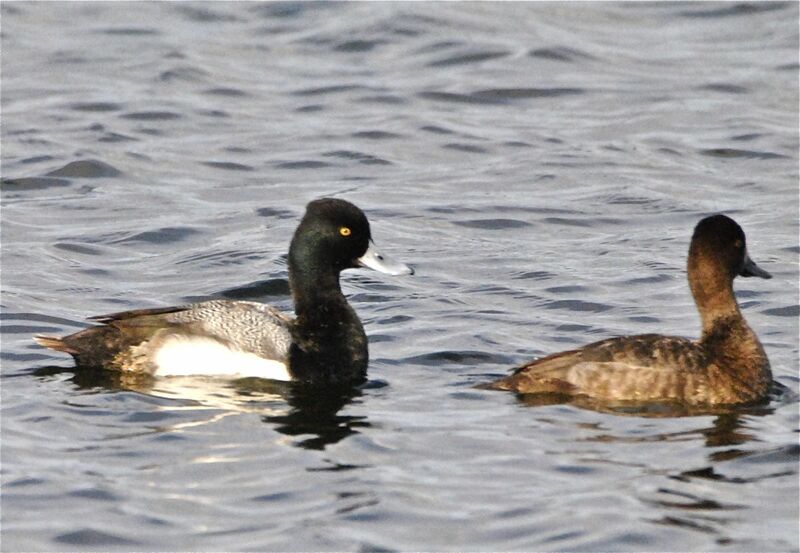 Lesser scaups mostly eat vegetation and seeds but crustaceans, mollusks and aquatic bugs are also on their menu. 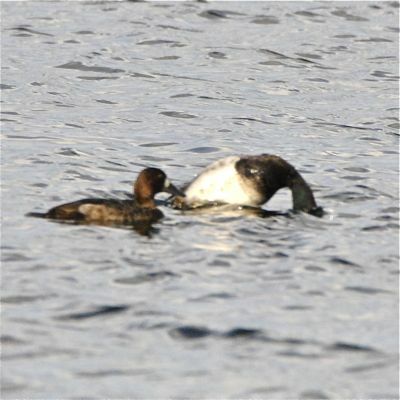 Scaup young are able to dive on a limited basis the day they hatch. Scaup nests are bowls of vegetation built on land or over water. Females lay a single clutch each year of six to 15 eggs, which require threee to four weeks of incubation. The young fledge in 45 to 50 days, but they will stay with their parents for a time afterwards. 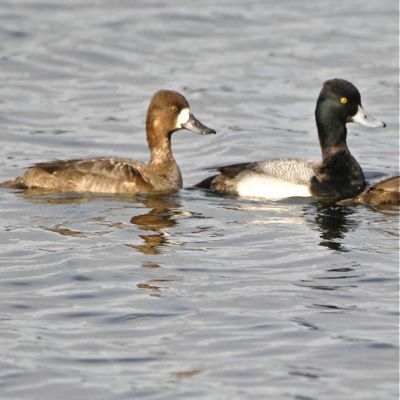 Although the International Union for Conservation of Nature ranks the bird as least concern, scaup numbers have been declining in recent years and no one seems to know why. Theories include loss of habitat and a decline in the number of surviving females. 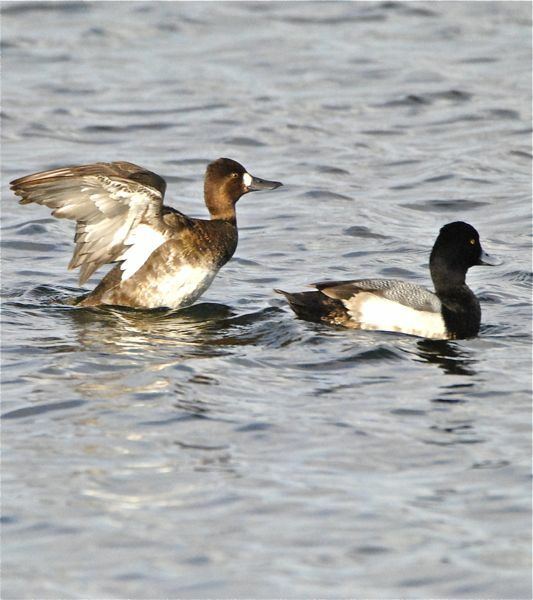 Lesser scaups are members of Anatidae, the duck family.